In the wild, the diet of the canine or feline was simple, consisting primarily of the prey they hunted. Though hunting that prey was quite a challenge, finding a simple yet complete food for your domesticated canine or feline shouldn’t be. 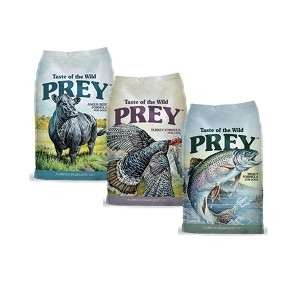 That’s why we created Taste of the Wild PREY limited ingredient diets – a simplified approach to pet food based on the animal’s native diet. Available flavors at Domina's Agway: Angus Beef Limited Ingredient Formula for Dogs, Trout Limited Ingredient Formula for Dogs, and Turkey Limited Ingredient Formula for Cats.